Some animals help pollination, bumblebees are particularly good at it. Their wings beat 130 times or more per second, and the beating combined with their large bodies vibrates wave after wave and force flowers until they release pollen, which is called buzz pollination. 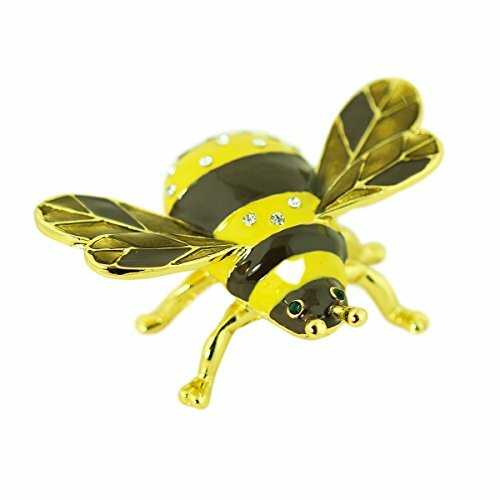 This bumblebee trinket box is made of pewter and is accented with clear Austrian crystals on his back , opens on a hinge with magnet closure inside. High polished enamel and 24k gold trim. His eyes are green crystals. Comes in a satin lined gift box. Dimensions: 2-3/4"L x 2"W x 1"H. Color: Yellow, Olive, Dark Brown, Gold. Material: Pewter, Austrian crystals. If you have any questions about this product by EchoMerx, contact us by completing and submitting the form below. If you are looking for a specif part number, please include it with your message.